The SOT-976FB lead is designed to interface between the hands free kit and the radio. The ISO lead supplied with the standard Parrot sales package will not plug directly into the car stereo. This optional adapter lead is included as it is required for integrating the Parrot car kit with the OEM car stereo speakers. This is a vehicle specific part and will only work with the cars listed in the compatibility table. No vehicle cables need to be cut when using this genuine part. 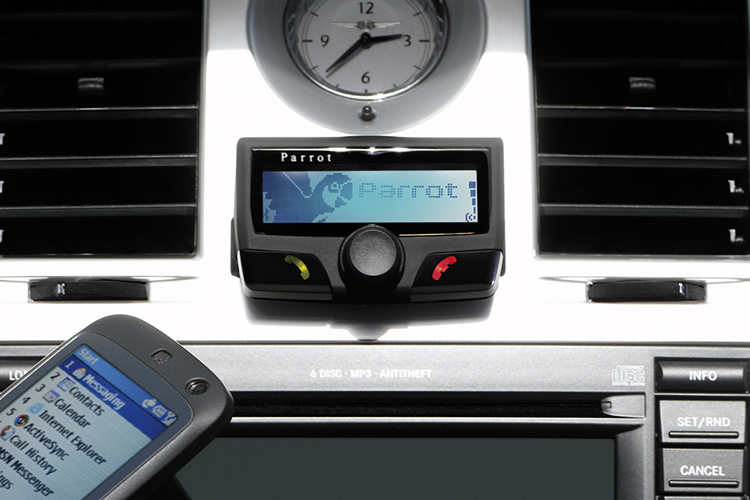 The Parrot CK3100 LCD is the most renowned hands-free car kit on the market. With the Parrot CK3100, you will be able to place and receive calls in comfort and safety, without ever touching your mobile phone. The dashboard mounted screen with buttons is small enough not to clutter your dash but big enough to make dialling calls and caller ID easy to see whilst driving. The CK3100 also allows up to 5 different hand sets to be ‘paired’ which makes it ideal for vehicles with multiple users. During a telephone call the stereo will mute any audio (music, radio, CD etc) and route the conversation through the front speakers of the car. This is possible by using a special autolead which is car specific and included as part of this package. Turn on the car engine and the phone connects wirelessly to the Parrot CK3100 Bluetooth Hands Free Car Kit, displaying the same visual information and functions as the mobile phone on a small screen that can be mounted in the ideal position for the driver to see. The screen unit has easy to navigate menu options just like a mobile phone and your mobile's phone book is wirelessly downloaded to the car kit. Calls can be dialled either through the screen or by using voice recognition speed-dialling. According to the phone model and firmware, most of the features people are familiar with are accessible from the hands free console, including one-touch redial, dual call, auto-answer, and caller ID. The Parrot hands free kit displays your mobile phone's information on the LCD screen : incoming call number, phonebook, last number called, and so on. The ingenious screen can be installed wherever users want on the dashboard and provides an optimized viewing angle for greater comfort and readability. ISO2Car SOT-976FB: This lead is designed to interface between the hands free kit and the radio. The ISO lead supplied with the standard Parrot sales package will not plug directly into the car stereo. This optional adapter lead is included as it is required for integrating the Parrot car kit with the OEM car stereo speakers. This is a vehicle specific part and will only work with the cars listed in the compatibility table. No vehicle cables need to be cut when using this genuine part.